Die Arbeitsgemeinschaft PVC und Umwelt e. V. (AGPU) beauftragt in regelmäßigen Abständen die Consultic Marketing und Industrieberatung GmbH mit der Erhebung abfallrelevanter Zahlen für PVC in Deutschland. So lag im Jahr 2007 die PVC-Abfallmenge bei circa 563.000 Tonnen. Das entspricht 12 Prozent des gesamten Abfallaufkommens. Der Anteil an Nachgebrauchs-Abfällen in dieser Menge lag bei ca. 403.000 Tonnen. Davon wurden circa 77.000 Tonnen werkstofflich und rohstofflich recycelt. Nimmt man die Produktionsabfälle dazu, so erhöht sich die stofflich verwertete Menge auf insgesamt ca. 221.000 Tonnen. Tatsächlich liegt die verwertete Menge aber höher. Denn nicht von der Statistik erfasst ist das so genannte In-House-Recycling. Dabei werden die an der Verarbeitungsmaschine anfallenden Produktionsabfälle zerkleinert und anschließend sofort wiederverwertet. Bezogen auf die Gesamtabfallmenge liegt die stoffliche Verwertungsquote bei rund 36 Prozent. Um wertvolle Ressourcen zu schonen und ihrer Produktverantwortung gerecht zu werden, hat auch die europäische PVC-Branche mit der freiwilligen Selbstverpflichtung Vinyl-Plus die Wiederverwertung der wichtigsten PVC-Produkte organisiert und setzt sich für die Zukunft ehrgeizige Ziele. So sollen bis zum Jahr 2020 rund 800.000 Tonnen PVC pro Jahr recycelt werden. Im vergangenen Jahr konnte das Nachhaltigkeitsprogramm laut aktuellem Fortschrittsbericht insgesamt 362.076 Tonnen recyceltes PVC registrieren. For more than 50 years, PVC has been very successful throughout the world. Today, this versatile material is one of the most important plastic materials recognised internationally and proven on the market. PVC has distinguished itself especially with its wide range of applications. PVC products are often cost-effective in terms of purchasing and maintenance. At the same time, they contribute more and more to sustainable development throughout their entire life cycle: this occurs by means of state-of-the-art manufacturing and production methods, the responsible use of energy and resources, cost-effective manufacturing and processing, as well as numerous recovery possibilities. 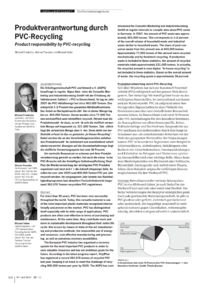 The European PVC industry has organised a recovery system for the most important PVC products in order to save valuable resources and has set ambitious goals for the future. According to the latest progress report, VinylPlus has registered a record 362,076 tonnes of recycled PVC last year, keeping it on track to meet the challenge of recycling 800,000 tonnes per year by 2020. The AGPU has commissioned the Consultic Marketing und Industrieberatung GmbH at regular intervals to compile data about PVC waste in Germany. In 2007, the amount of PVC waste was approximately 563,000 tonnes. This corresponds to 12 percen tof the overall volume of household waste and industrial waste similar to household waste. The share of post-consumer waste from this amount was at 403,000 tonnes. Approximately 77,000 tonnes of this amount were recycled mechanically and by feedstock recycling. If production waste is included in these statistics, the amount of recycled materials totals approximately 221,000 tonnes. In actuality, the recycled amount is even higher. In-house recycling is not included in these statistics. Based on the overall amount of waste, the recycling quota is approximately 36 percent.